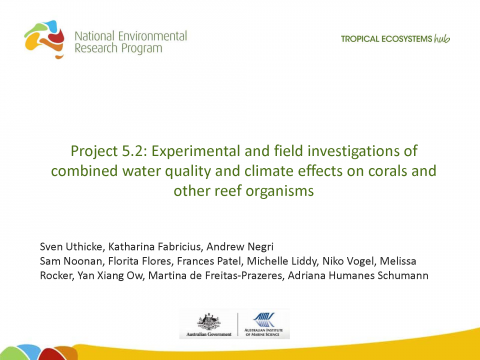 Sven Uthicke (AIMS), Katharina Fabricius, Andrew Negri, Sam Noonan, Florita Flores, Frances Patel, Michelle Liddy, Niko Vogel, Melissa Rocker, Yan Xiang Ow, Martinda de Freitas-Prazeres, Adriana Humanes Schumann; Experimental and field investigations of combined water quality and climate effects on corals and other reef organisms; Thursday 9th May 2013. 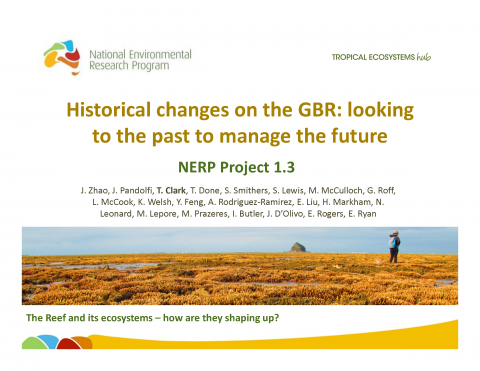 Zhao J, Pandolfi J, Clark T, Done T, Smithers S, Lewis S, McCulloch M, Roff G, McCook L, Welsh K, Feng Y, Rodriguez-Ramirez A, Liu E, Markham H, Leonard N, Lepore M, Prazeres M, Butler I, D'Olivo J, Rogers E, Ryan E; Historical changes on the GBR: looking to the past to manage the future; Thursday 9th May 2013. 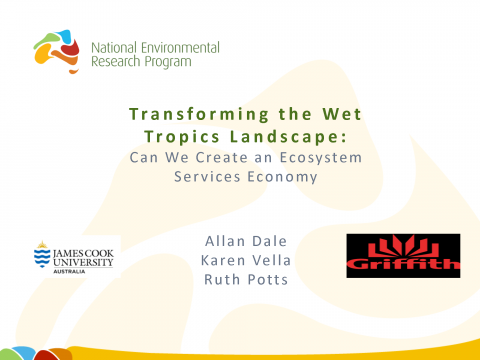 Allan Dale (JCU); Transforming the Wet Tropics landscape: Can we create an ecosystem services economy; Thursday 6th November. 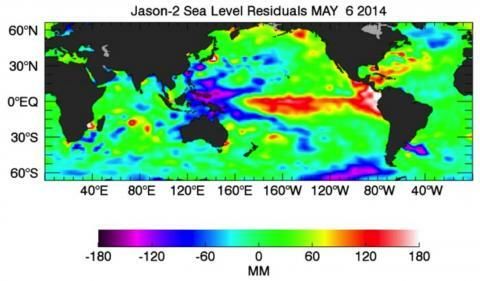 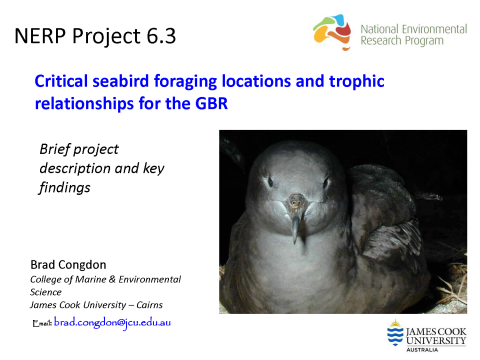 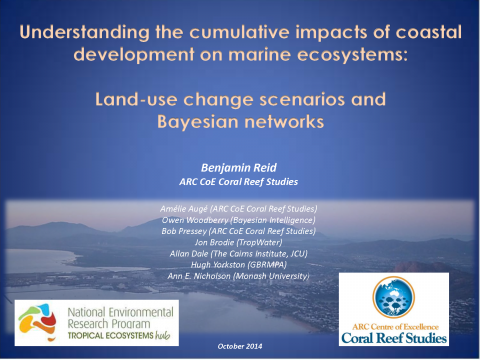 Brad Congdon (JCU); Critical seabird foraging locations and trophic relationships for the GBR; Thursday 6th November. 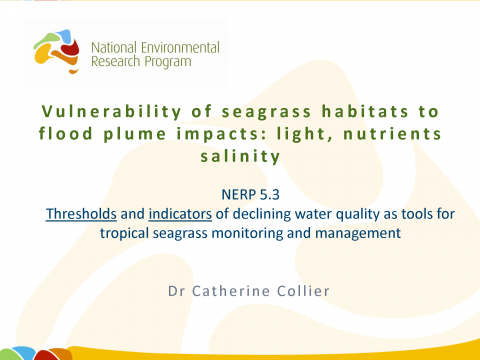 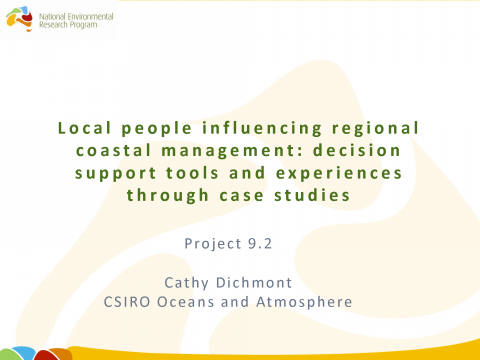 Cathy Dichmont (CSIRO); Local people influencing regional coastal management: Decision support tools and experinces through case studies; 5th November 2014. 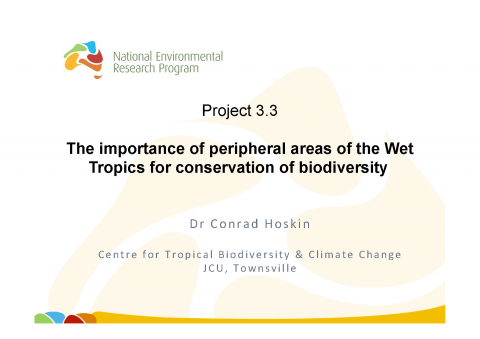 Conrad Hoskin (JCU); The importance of peripheral areas of the Wet Tropics for conversation of biodiversity; Thursday 6th November. 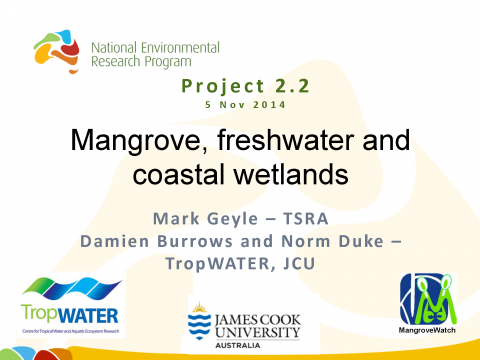 Damien Burrows (JCU), Norm Duke (JCU), Mark Geyle (TSRA); Mangrove, freshwater and coastal wetlands; Wednesday 5th November.